As always sleep is still so up and down. He has to level out one day right? He did sleep 10 hours straight one night this week though. It was lovely and amazing but of course me and mark still woke up worried so checked on him twice. Apart from that it's been his usual 2-3 times with a night of 5 times thrown in to equal out the straight 10 hours haha. Parker started another leap this week Which could explain the the night of him waking up 5 times. I really don't miss the leaps when they finish. It's amazing to see yournbabynchznge and develop but the leaps,are hard work sometimes. This weeks naps have been rubbish. He got into such a good routine of having two hours over lunch and now he is refusing... I'm guessing that's because if the leap. 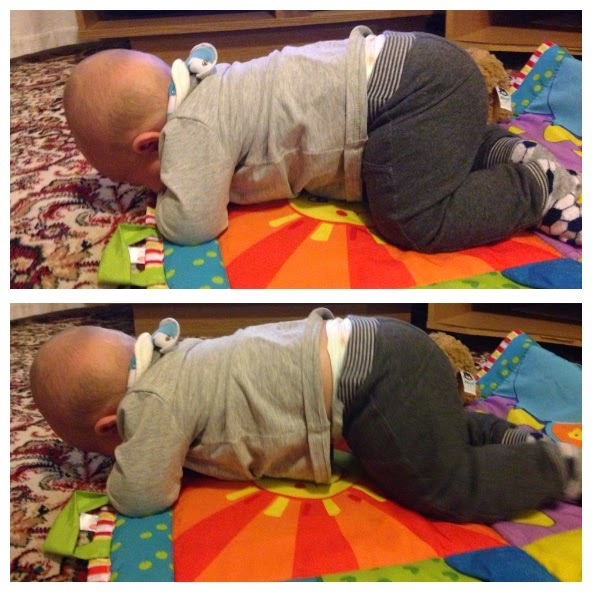 He got up on his knees and elbows trying to crawl. He chews his hands so hasn't quite figured out that he needs to use his hands to crawl but it doesn't stop him and he can push and drag himself along the floor. He doesn't always do it and it's not super fast but he's getting there. I can't believe he is mobile! Parker also cut his bottom teeth! I can't believe it. 5 and a half months and he got his bottom left tooth and is cutting his bottom right. Paige didn't get teeth until 8 months so we weren't even expecting it. I should of guessed as he had the same signs Paige did before getting a new tooth. Bright red cheeks and a sore bum. We still haven't started weaning and plan to wait until 6 months. But this week parker lunged for my banana. It was so cute and he loved it. I don't think he actually ate anything but he loved sucking on it.